A Germany-based AV company with global operations has released a new system that delivers assistive listening over WiFi to a student's smartphone. 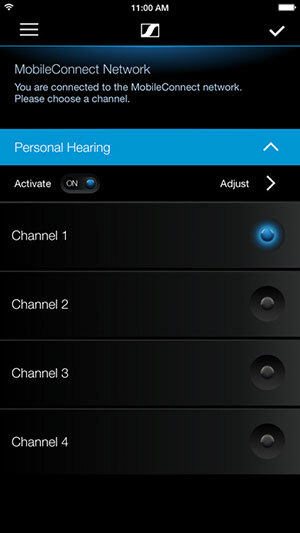 Sennheiser introduced MobileConnect during the recent Integrated Systems Europe (ISE) 2017 conference, which took place in Amsterdam last week. The product works over existing wireless infrastructure and allows the user a choice of smart device and headphones to listen to audio via a free app. Here's how it works: Once the user downloads the app to a smartphone or tablet, he or she connects to the MobileConnect network within the venue, starts the app and chooses the hearing support channel. The app lets the user adjust the sound to suit personal needs through a "personal hearing assistant." The venue installs Sennheiser directional microphones in the space. The signals from those mics are routed to a "ConnectStation," which sends the sound back into the space to be heard through the wireless network, letting users pick up the audio signal via their smart devices using Ethernet. The technology is compatible with hearing aids, cochlear implants and earphones. The system was developed in cooperation with the Fraunhofer Institute, a national applied research organization that conducts its activities through 69 institutes and research units around Germany. "MobileConnect utilizes existing network technologies and a 'bring your own device' approach," said Xenios Maroudas, the portfolio manager of business communication, in a prepared statement. "The system thus reduces the total cost of ownership for organizations such as universities by removing barriers to being able to offer a genuinely practical to the needs of hearing impaired students." The MobileConnect app is available in the Apple AppStore and Google Play.